Germany is the Europe largest economy and the second most populous nation . Germany’s economy is the fifth largest economy in the world and a leading exporter of capital machinery automobiles chemical and household electric equipment. Germany is regarded as one of the superpower in the world, it’s a nuclear Armed country and have a permanent membership in United Nations Security Council. Germany yearly Gross Domestic Product is more than 4.1 trillion in 2017 and its GDP growth rate is 2.5 %. the GDP per capita is 50800 Dollar. Germany’s economy is most influenced by industry and service sector agriculture is 0.7 % , industry is 30.7% and service account to 68.6 %. Germany have low unemployment rate 3.8% in 2017 .Germany yearly import more than 1.1 3 trillion sum of goods from various countries and export more than 1.43 trillion dollars sum of goods to the world . Germany is divided by 16 States and its capital is Berlin. Germany do not give citizenship by birth. A permanent residency ship can be given after 8 years in residence in Germany. The flag of Germany have historical significance horizontal bands of black red and gold color can be traced back to the medieval banner of holy Roman empire. Germany’s national symbol is Eagle national color is black red and yellow. in Germany more than 91% is ethnic German 2.4% Turkish and another 6.1% from various European National like polish Italian Romanian Syrian and Greek . Germany have 29.7 Roman Catholics 27% protestant and 4.4% Muslim population. around 1.7% Germans regarded as atheist or not a member of any religious group . Germany have high obesity rate more then 22% German people regarded as obese . In second Second World War the Nazi Germany was defeated by allied force, and Germany was divided by 2 part . the in Berlin was was formed and demolished in 1990 . Germany United as today’s Germany . in 1999 Germany introduced the common European exchange currency Euro. The headquarter of European Union is in Brussels and Germany now play a major role in the policy making of European Union and it’s defense intelligence Agency i Federal Intelligence Services or BND is one of the most influential Intelligence Agency in the world . Germany is a European country it’s a border with Denmark Poland Church become republic Austria Switzerland and France. 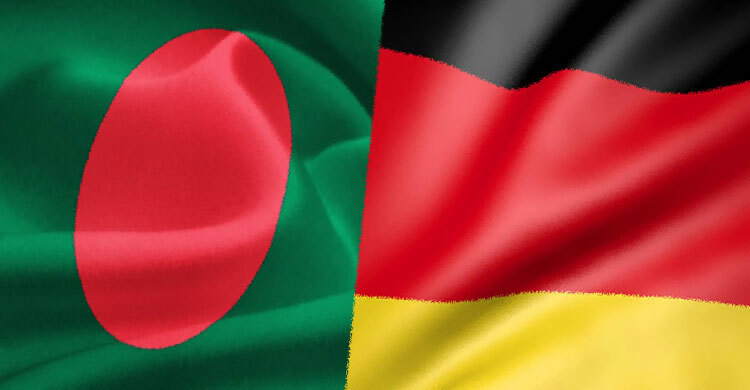 the relationship between Bangladesh and Germany is Warm and friendly. Germany is the third country in the world recognized Bangladesh on the early stage & first in the Europe. Bangladeshi products have duty free access in Germany’s market .Germany is the third largest trading partner of Bangladesh, yearly Bangladesh exported more than 6 billion Euro goods to Germany and its 70% is textile.Bangladesh versus import mountain 700 million euros goods from Germany mainly machinery Product . From 1972 Germany provided 2.6 Billion euros for bilateral development project in Bangladesh in 2016 Germany placed for 261 million euros for various project in Bangladesh and 2017 Germany Announced to provide 83 million euros for renewable energy in Bangladesh. German direct invest in Bangladeshi small in 60 mm. More than 3000 Bangladeshi student are now currently studying in various Germany University.